While you wait for the secrets of the Q1 Quest to be revealed, I have some exciting news that I can share with you. As recently announced in the April Telerik Newsletter, Telerik in partnership with Falafel is delivering an industry first with the Q1 2007 release: a full 500+ page (584 to be precise) training guide for RadControls for ASP.NET. The book covers all 18 RadControls for ASP.NET and has everything you need to become a master of the RadControl suite. Falafel Software is an international provider of development, consulting, and training services that has worked with the RadControls for many years. 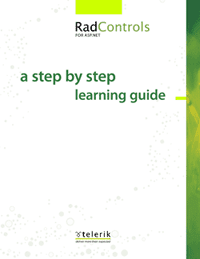 Their knowledge and expertise have been poured into this book making it an useful resource for RadControl newbies and experts alike. In addition to the RadControls, the book also includes some basic information about Ajax, MSDE, and Firebug. The book will be made available for download with the Q1 release to all Telerik customers. So there you have it. One secret revealed and many more to come!